Summer and kids in the kitchen is the perfect combination. 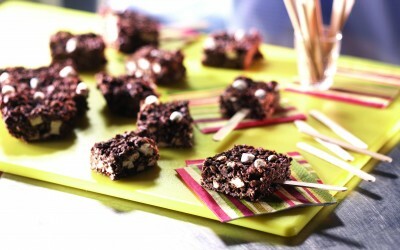 What a fun learning experience it is to make snacks and desserts the kids enjoy. 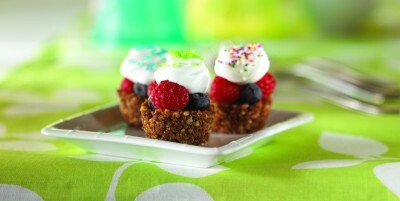 Making easy, no-bake goodies like Rice Krispies Treats(r) can show kids just how fun cooking can be. Kids have fun washing or scrubbing fruits and vegetables, shaping foods, measuring and mixing dry ingredients, or even pouring pre-measured liquids into the mix. Measurements, team work, and following instructions become a fun educational part of the kitchen experience. 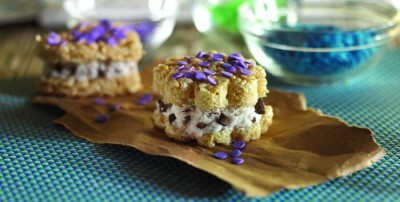 Make some summer magic with these tasty no-bake recipes for Choco P’Nutty Bars, Itsy Bitsy Fruit Pies, and Ice Cream Sandwich Treats from Ricekrispies.com. In large saucepan melt butter over low heat. Add marshmallows and stir until completely melted. Remove from heat. Stir in vanilla. Add cereal. Stir until well coated. In large microwave safe bowl, melt chocolate morsels and peanut butter at medium power for 2 to 2 1/2 minutes. Stir until smooth. Add remaining ingredients, stirring until well coated. Continue with recipe directions. With this many yummy summer treats, mom may just need a few appetite suppressants!! Next4G iPhone for Dad, maybe?